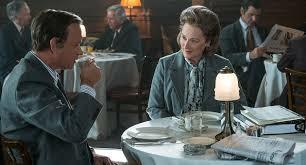 Combine the magnificent iconic acting talent of two Hollywood heavyweights in Meryl Streep and Tom Hanks, with the skills of one of the worlds most decorated movie makers in Steven Spielberg to retell a poignant, nostalgic yet timely tale and it's no surprise that both critical and audience reaction to The Post has been so overwhelmingly positive. This thrilling drama tells of the unlikely partnership between The Washington Post's first female publisher Katharine Graham (Streep), and editor Ben Bradlee (Hanks), as they race to catch up with The New York Times to expose a massive cover-up of government secrets that spanned three decades and four U.S. Presidents. The timing of the release of this movie is anything but subtle as it's cinematic release is quite rightly at a time when the Award committee's will be casting their collective eyes on the features worthy of critical acclaim and this undoubtedly falls into that category. Politically, also this film which may deal with a time gone but also contains certain messages, lessons and nods to the current landscape in which we now dwell with the battle of press versus politics as relevant as ever in modern life. Strong moral themes aside, this is also a spectacular piece of film making that has all the prints of the giants of the industry at work. Streep is again unflappable as Katharine Graham bringing gravitas and poise to her role as she always does and if not for Saoirse Ronan or Frances McDormand would definitely be bringing home another Oscar to add to her collection this March. Tom Hanks too is exceptional here also capturing that never give up attitude shown to Ben Bradlee to perfection and can count himself unlucky that his name was not included in the recent list of Academy Award nominees. Both actors are joined by a stellar supporting cast including Bruce Greenwood, Bob Odendirk, Sarah Paulson and Bradley Whitford who all contribute to bring this wonderful piece of film to life. It is in the hands of iconic director Spielberg however, that this film truly soars as he builds tension in a way that only he knows how, disctreetly giving the viewer a clever civics lesson whilst simultaenously entertaining them with all the thrills and spills that every movie should contain. Overall, The Post is an important yet highly entertaining piece of film filled with fantastic performances delivered by a wizard of the movie world who shows no sign of letting up anytime soon! Highly recommended.